Year of record sales, but at what cost to the art? 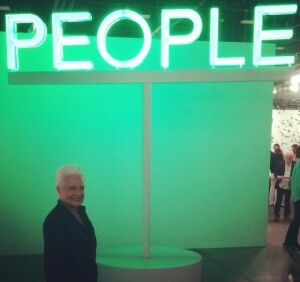 The art market appeared to be in rude health as 2014 drew to a close. More money was spent on blue-chip and emerging art last year than at any other point in history, and the trade has been in rapid expansion mode. But under the surface, the tectonic plates are shifting, and unease is bubbling up about the effects of the market on the art that fuels it. Buyers spent a staggering $1.66bn on contemporary art in four days of auctions in New York last November, including a record-breaking total of $852.8m at Christie’s. Even so, both houses dropped their chief executives soon after the sales. Sotheby’s has yet to announce a successor to Bill Ruprecht, while Christie’s has replaced Steven Murphy with Patricia Barbizet. She is François Pinault’s long-time and trusted executive but may prove to be an interim head of his auction house. Whoever ends up in charge of the auction houses faces big challenges. They need to mend strained internal relationships: the rush towards corporate growth has frustrated the specialists, many of whom feel sidelined by the companies’ aggressive diversification into new geographic and digital areas. Should the houses choose to refocus on profits over market share, we may see changes in their hawkish guarantee strategies. In November alone, Christie’s backed contemporary art worth at least $429.8m, and Sotheby’s $184.2m, in expensive private deals with unknown margins. Meanwhile, the underdog is in the ascendant: Phillips, now under the leadership of former Christie’s chief executive Edward Dolman, has been on a stealthy recruitment drive. 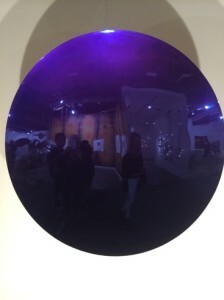 Sandwiching the auctions were art fairs at which dealers reported strong sales, including Frieze in London last October and Art Basel in Miami Beach last month. 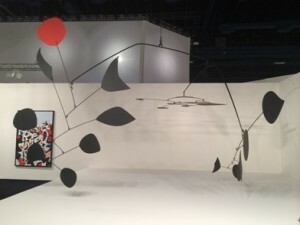 Both art fairs have expanded over the past couple of years and now find themselves in transition. The founders of Frieze, Matthew Slotover and Amanda Sharp, are handing over the reins of their contemporary fairs. This comes at a point when the costs of running their New York event (14-17 May) will be higher than ever, after an agreement to use union labour. Meanwhile, the senior management team at Art Basel halved in 2014 with the departure of Annette Schönholzer, who will not be replaced, and Magnus Renfrew, Art Basel’s former director in Asia. With its Hong Kong fair just months away (15-17 March), Art Basel had yet to announce Renfrew’s successor as we went to press. Corporate growth and culture have gripped the gallery business, too. A few dealers have been moving to some of the most expensive real-estate in the world. This is something of an anomaly, says Max Hollein, the director of the Städel Museum in Frankfurt. “The percentage of square footage of city centres in London, New York and Paris devoted to art and art dealing has suddenly risen. It’s [a trend] that might be considered unhealthy at a certain point,” he says. The difficulty, some argue, is that the pressure for product is shaping the work. “Business art” was radical when Andy Warhol invented it, and still a novelty when artists such as Jeff Koons, Damien Hirst and Takashi Murakami crafted their works of Pop-culture-meets-commerce. Today’s artists simply cannot ignore it. This is the “age of the market-native artist”, says Gregor Muir, the director of London’s Institute of Contemporary Arts. “Artists are born, like it or not, into the market. It’s impossible to escape; it envelopes them. It’s up to them how they resist it—if they resist it,” he says. Some market darlings have been tempted to cash in. Several have business plans to “make $5m in five years, like rock stars”, says one trade professional. Other in-demand artists have tried, in vain, to scupper their markets—such as Wade Guyton, who reprinted multiple copies of an existing work that was set to go to auction (Guyton’s inkjet Untitled, 2005, still sold for $3.5m at Christie’s in May 2014). Like punk music, new art has been co-opted. The dynamics have tilted in favour of the patrons. 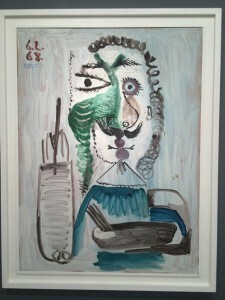 “There’s no doubt that collectors have taken control of the art world. Critics have taken a back seat,” says the art adviser Todd Levin, the director of the Levin Art Group. “There’s a breed of buyer that’s playing for history. They want to be recognised as the ones who made the discoveries.” The problem is that these tastes seem rather myopic. “Big, messy, abstract painting about individualism,” says Gabriel Pérez-Barreiro, the director and chief curator of the Colección Cisneros. “You don’t see this so much in Latin America, for example, where the market is weak. In the US, it’s hard for artists to navigate the pressures and the competition, especially when they pay so much to go to art schools,” he says. Such upheaval could be imminent, Levin says. He points to the drastic slump in oil prices and the collapse of the Russian rouble in December, and to the contraction in Chinese manufacturing and currency volatility in the financial markets. “Should the contagion spread to the US economy, then it’s anybody’s guess as to how it will play out,” he says. “It is quite possible that the art market has reached a summit." A tropical climate, dazzling beaches, beautiful people… and a birthday. In 2015, Miami Beach will celebrate its 100th anniversary with a series of commemorative events that will adorn an already packed cultural calendar (for more information see miamibeach100.com). A seaside resort designed from the outset to attract holidaymakers and retirees – like a bigger, bolder Bournemouth – Miami Beach blossomed during the Art Deco heyday of the 1920s and 30s, spawning an architectural sub-genre called MiMo (Miami Modern) that majored on porthole windows and ocean-liner motifs. You can tour the best of the city’s buildings in the company of the Miami Design Preservation League (mdpl.org), which has just opened an Art Deco Museum on Ocean Drive, the city’s gracious main thoroughfare. “Snowbirds” – elderly holidaymakers keen to escape the harsh winters of the northern USA – still flock to Miami Beach for the balmy weather, but these days the city is on the up: it’s less about wrinkles, more about wow-factor. Frank Gehry designed the New World Center concert hall in South Beach, contemporary art lovers are drawn to the annual Art Basel Miami Beach show, and the chic hotels of Collins Avenue throw nightly poolside parties where glamorous young things parade the latest designer gear. In 2015 there are a couple of additional reasons to choose Miami Beach for a holiday: Ian Schrager, long fêted as the inventor of the boutique hotel, has just opened his ever-so-elegant Miami Beach Edition in partnership with Marriot Hotels (edition-hotels.marriott.com), while Thomson Hotels has revamped a 1940s art deco skyscraper to deliver what it calls a “mid-century seaside oasis for the 21st century”. If these new arrivals weren’t endorsement enough, British Airways recently announced that it will start twice-daily flights using the Airbus A380, the world’s largest passenger airliner, between Heathrow and Miami from October. The reasoning is clear: a century’s-worth of tourists can’t be wrong. How to go: British Airways (0844 493 0758; ba.com) flies twice a day from Heathrow to Miami, and from October 25, 2015 will operate the A380 superjumbo twice daily. Return fares start from £717. ROME — The best way to get to Monitor gallery is to avoid the crowded road that runs by it and venture instead into the maze of alleyways of the city center. Passing by the myriad of columns, Renaissance plazas, and Baroque churches, you’ll arrive at the immaculate space with almost a sense of relief. Paola Capata inaugurated Monitor in 2003 with the aim of showing video art in Rome. Over the years the program has changed slightly, opening up to a wider range of media and turning the gallery into the cutting-edge space that it is today. In particular, Monitor has become a reference point for a group of young Italian artists including Francesco Arena and Nico Vascellari, whose works are starting to gain attention in the wider art world. But Monitor — which emphasizes curatorial endeavors and often features site-specific installations — also counts among its ranks the artists Ian Tweedy, Nathaniel Mellors, and Guido van den Werve, giving the space an international vibe. “The eternal city” has a peculiar relationship with 21st-century art — its exceptional heritage often seems to overwhelm more recent artistic expressions. In 2010 the Zaha Hadid-designed MAXXI, the National Museum of the 21st Century Arts, opened its doors to the public, and while it might sound incredible that the most important Italian museum of contemporary art was inaugurated only four years ago, MAXXI’s late birth confirms the difficulties of presenting present-day art in Italy. Yet it also shows an increasing will to place the country and its capital on the map of the international art scene. In the wake of the museum’s opening and the feeling of excitement it generated, a considerable number of new art galleries opened in the capital. The financial crisis caused most of them to close in the following months. In spite of difficult times, Monitor has kept on bringing fresh air to the Roman cultural scene. In part this has meant looking for new opportunities outside national boundaries, and in January 2014 Capata opened a temporary space in New York, where she’s presenting Slide Show, a series of solo shows with the aim of promoting some of the gallery’s artists. 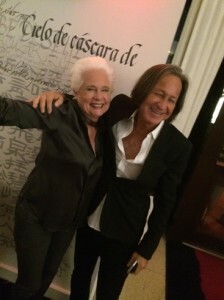 I visited with Capata to talk about her gallery, the Roman art scene, and her experience in New York. RECKLINGHAUSEN An den Feiertagen muss niemandem die Decke auf den Kopf fallen: Die Kunsthalle am Hauptbahnhof hat an allen drei Tagen geöffnet. Auch Familien sind im Museum gern gesehen. Interessierte können die aktuelle Ausstellung „hängengeblieben. 25 Jahre Kunstverein in Recklinghausen“ besuchen. Die Kunsthalle an der Große-Perdekamp-Straße 25-27 hat an Heiligabend, 24. Dezember, und Silvester, 31. Dezember, jeweils von 11 bis 14 Uhr geöffnet. Am ersten und zweiten Weihnachtstag und Neujahr ist das Haus von 11 bis 18 Uhr geöffnet. Am Sonntag, 28. Dezember, 11 Uhr, steht zudem eine öffentliche Führung mit Kunsthistoriker Thomas Hensolt an. The event not to be missed for all art lovers, collectors and dealers of the world, is the famous Art Basel! Although I have not had the good fortune to travel to the original art fair held in the spring in Basel, Switzerland, the first week of December attracts the largest collection of art exhibitors in the world in beautiful Miami. The festivities start the Monday after Thanksgiving with parties and previews and fabulous art buying opportunities. Approximately 250 of the most important art galleries in the world exhibit in the main convention hall in Miami Beach which opens to the VIP crowd on Wednesday morning through Sunday. As you walk in the door of this enormous convention hall, you feel a virtual spiritual experience because of the extensive collection of magnificent art works. The worldwide energy and effort that goes into this event is staggering. To study the art carefully in this massive exhibition will take you many many days. When you return each day, you tend to gravitate to the works of art that attract you the most. I have included here a few of my favorites which I photographed. Interestingly, I neglected to photograph the iPad art of David Hockney, which has been extremely tempting as a possible purchase. It was great seeing so many friends from all around the world, as well as attending the amazing social events connected to all of the artists. Nick Jones, Soho owner, hosted a fantastic luncheon in the Soho House tent on the beach next to the water with his many wonderful friends and artists that are part of the extraordinary Soho House family. One of the tickets was a personal visit with Peter Marino at the Bass Museum, which had a special exhibition of his astounding architecture, as well as his own personal art collection. Another sold out event was a Miley Cyrus concert at the Raleigh Hotel. Crowds began to gather quite early, and we were all warned to pick up our wrist bands in advance. She puts on quite a show, and certainly energizes the crowd! Who doesn't love rock and roll - 2014 style! Coldwell Banker joined in the festivities by hosting a VIP dinner with Haute Living, Hublot Watch Company, and Dom Perignon at the magnificent estate of William Dean, with an after party where everyone danced the night away. 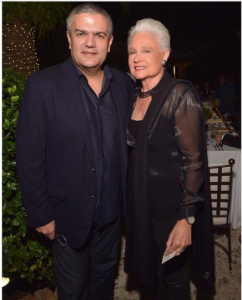 I'm pictured here with Ricardo Guadalupe, CEO of Hublot, who joined Coldwell Banker and Haute Living in hosting the very exclusive Art Basel VIP dinner and after party at the exquisite Villa Terra Veritatis on the water overlooking Miami Beach. The yacht on the front dock was to die for! I loved dining with friends at Mr. Chow, and visiting the additional fairs for emerging artists as well as the terrific Design Fair showing extraordinary interior design and the list goes on and on. This sell out event, sponsored by UBS gets bigger every year! One of the fun points of the week was a tour of some of the top Miami residential properties for sale with "the Jills". Coldwell Banker has a corner on that Miami market. I am looking forward to a return trip next year.